"The first dark restaurant in Asia is officially opened on the 23 December 2006. This restaurant, located in Beijing, China, has its interior painted completely in black. 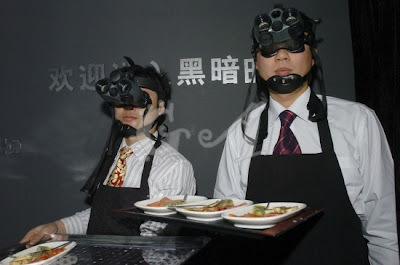 Customers are greeted by a brightly lit entrance hall and will be escorted by waiters wearing night vision goggles into the pitch dark dining room to help them find their seats. Flashlights, mobile phones and even luminous watches are prohibited while in this area. The meal will be taken in this environment with the complete loss of vision. By starving one’s sense, your other senses are stimulated to full alert – all so the theory goes – and your food will taste like it’s never tasted before. In case you are wondering about the washrooms, they are all brightly lit. DARK Dining in San Francisco by TasteTV and Million Dollar Dinner takes you into another realm of dining, one where all of your senses are expanded and focus on the food, the taste, the sound, the company and more...because you are dining completely in the dark. Dark dining is not low light dining, it is no light dining! TasteTV's food, wine and lifestyle editors have tracked this growing culinary experience across the globe and are now bringing it to Northern California and the San Francisco Bay Area. During the evening, for two entire hours, guests will eat, drink, talk, and enjoy entertainment in complete and total darkness. The flavors and textures of thir food will take on an entirely new dimension, as will the quality of their conversation (or perhaps of their dates). DARK Dining SF will take place in September on Friday evenings at 8pm, in San Francisco. Location information, and reservations, menu, and the chef's bio, can be found at the Dark Dining SF site, http://www.SFDark.com. For information about TasteTV's San Francisco International Chocolate Salon, go to http://www.SFChocolateSalon.com. Jason Priestley and 90210 Wine Tasting? By the way, Wine Expressions has their own version of this type of show, which you can see here.